DJzone DJ Magazine Karaoke Theater? Singing 'nun': Patrons at the Prince Charles Cinema in London dress the part to sing along with Julie Andrews. London joined the chorus without protest; New York and San Francisco are next. Since July, hundreds have been lining up outside the Prince Charles Cinema off Leicester Square on Friday nights and Sunday afternoons to watch Singalong-A-Sound of Music. The concept is simple: The 1965 film is shown with the addition of subtitled lyrics during each of the memorable Rodgers and Hammerstein songs. The result is astounding: People sing. No mere humming, this; we're talking karaoke-en-masse as row upon row belts out My Favorite Things. And more. 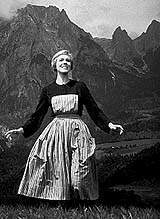 They cheer Julie Andrews' every entrance. They hiss the baroness and boo the Nazis. They dress up as Maria, as nuns and as characters from signature tunes. "I've been practicing for this for 30 years," says Juanita Cheung, 35, an architect who has arrived dressed as a needle and thread. "You know, 'Sew, a needle pulling thread.'" Singalong producer David Johnson was convinced of the concept's potential from the first time he saw it a year ago at a London gay and lesbian festival. "It's almost a primal thing for anyone over 30," he says, seriously. "It's much more than singing along to songs you realize you already know. It goes deep into the contemporary psyche." Johnson plans to bring Singalong to New York this fall; negotiations also are under way with San Francisco theaters. Next up for the Singalong treatment: Grease. While Singalong-A-Sound of Music continues to be nurtured by the gay community, its audience now is far broader. "Work is stressful, and I thought singing along with Julie would cheer me up," says Pippa Jones, 51, a personnel director who tonight looks like a bona fide nun. For those who haven't come prepared, Johnson sells Singalong kits for $4.50. They include a foam nun (to wave during the opening nun sequence), a fake edelweiss flower (for Christopher Plummer's solo number) and Ricola mints for the ensuing sore throat. Unlike another famed sing-along, The Rocky Horror Picture Show, this event has no elaborate rules - yet. You just yell out what you feel. A recent screening produced waves of wisecracks. When Maria is told she must care for the captain's seven children, someone shouts, "That's slave labor!" And when the captain, riding crop in hand, takes a walk with the baroness, the audience banter turns blue. The costumes are fun, and the repartee is witty. But what really recommends Singalong-A-Sound of Music is the chance to become young again. Where else can an adult kick into "Doe, a deer" while putting two fingers up to each ear and feel perfectly sane? You can bring the kids to this show, but remember, you'll be among them.